Losing weight in America is a multi-million dollar industry for people who want to lose weight fast without having to resort to painful dieting and strenuous exercises. Weight loss supplements ranging from diet pills to herbal solutions are being marketed as magic alternatives for calorie restriction and exercises that will make you look trimmer within mere weeks. However, most doctors do not recommend you take any weight loss supplements without prior doctor’s approval if you are severely overweight, have a host of medical conditions or food sensitivities. It’s important to understand that weight loss supplements are not a substitute for eating healthier and increasing your exercise levels and should only be attempted with your doctor’s approval after careful consideration of all possible side effects. Below we list top 10 weight loss supplements for your consideration. 1. Slimming tablets or diet pills contain an array of natural and chemically derived ingredients designed to burn more fat, suppress appetite, enhance your metabolism and lipid exchange. Most diet pills contain hefty doses of caffeine that is supposed to provide you with energy to exercises and feel better with less food, however it can leave you feeling anxious and jittery. Until recently some diet pills listed ephedra as one of their powerful ingredients, however, it was banned in the US in 2004 due to its deadly side effects. 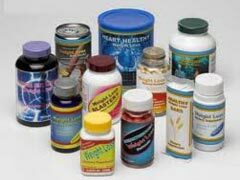 It has been proven that almost 90% of diet pills that are sold in the US are simply not working and can even bring negative side effects. Always consult with your doctor as to taking any diet pills! 2. Thermogenic fat burner products are formulated to increase your body’s ability to process fats by speeding up your metabolism. In addition to burning fats, thermogenic products also contain ingredients that suppress appetite and give you more energy. Some of the top rated fat burners available on the market today are Apidexin and Phenphedrine. 3. Hoodia Gordonii is a widely advertised herbal appetite suppressant that has been used by the natives living in Africa for centuries. Local Bushmen were chewing on Hoodia Gordonii plan during long trips across the dessert where food was not available. This herbal supplement wards off hunger and thirst; however, if you take Hoodia Gordonii it’s important to drink water even when you do not feel like it to avoid long term dehydration. In addition this weight loss supplement reduces production of gastric juices making you even less hungry. While there are a lot of skeptics out there doubting the effectiveness of Hoodia Gordonii, the herbal supplement without a doubt is a great potential for weight loss and needs to be studied further. When looking for a Hoodia Gordonii supplement, it’s important to only buy from respectable sources to ensure authenticity. 4. Laxatives to lose weight are very often used by people who are desperate and want to lose a few pounds fast. Laxatives are herbal or medicinal preparations created to facilitate body waste elimination mechanism. We would like to warn you against using laxatives for weight loss purposes because it could be very dangerous for your health. Using laxatives for prolonged periods of time can interfere with your body’s natural waste elimination patterns, lead to chronic diarrhea, nutritional deficit and severe dehydration. Moreover, using laxatives as weight loss supplements is ineffective because by the time they have a chance to work, your body has already taken all the ingested calories from foods. You might lose a few pounds initially but it’s mostly water weight that was forced out of your body by laxatives not your extra fat weight. 5. Metamucil weight loss solution is another highly controversial way to lose weight. Metamucil has never been marketed as one of weight loss supplements, however, some patients are encouraged to take it in order to regulate digestion, add bulk to stools and reduce the numbers of bad cholesterol. The main ingredient of Metamucil fiber can have a number of unpleasant side effects if you take it on a regular basis like gas and bloating. In addition, regular doses of Metamucil can negatively affect the absorption of vitamins and minerals by your body. Bottom line, Metamucil is fine to take occasionally if you are battling constipation from time to time; however Metamucil supplement as a weight loss aid has not been scientifically proven to work. 6. Green Tea Extract (GTE) has been proven to help obese people reduce their overall weight and keep it off for longer opposed to people who did not take GTE. Active ingredients in green tea are caffeine, antioxidants and catechins. Drinking regular green tea will not work because you will have to drink lots of it, so only GTE was proven to bring true weight loss results by increasing energy usage. 7. Alli (Orlistat) is an over the counter diet pill program that is intended to boost your body’s fat burning mechanism in combination with calorie restriction and exercise. Ingredients in Alli work by blocking fat absorption by your stomach. Compared to just diet and exercise alone dieters taking Alli were able to lose just anywhere from 5-15 pounds a year more. Some nutritionists do not believe that Alli is potent enough to lose a lot of weight fast. 8. Meal Replacements in forms of shakes, powders and bars are all great weight loss supplements that are satisfying, low calorie products allowing you to lose weight in a comfortable way for you. Meal replacements work the best if you follow instructions on the packaging to a tee. All meal replacement products are portion controlled so there’s no guessing game when you lose weight. These also come in a number of scrumptious flavors that resemble more dessert bar selections at your favorite restaurant and not weight loss supplements. 9. Omega 3 fatty acids are incredibly potent natural substances helping you regulate your blood glucose levels and promote healthy lipid exchange. If the latter takes places, you are going to feel fuller longer and burn fat faster. When searching for Omega 3 weight loss supplements, look beyond fish oils that are not stable and get rancid before they even reach store shelves. In addition, fish oils contain mind boggling amounts of mercury contaminants. Krill oil is almost 50 times more potent compared to fish oil and supplies your body with antioxidants and Omega 3 fatty acids. While krill oil alone can not help you lose weight, it can become a great weight loss supplement in addition to a healthy diet and exercises plan. 10. Irvingia gabonensis is among a few natural weight loss supplements derived from a West African plant. This West African herb has proven in clinical studies to help people lower bad cholesterol, trim inches off their waistlines and regulate blood glucose levels. The herb was especially beneficial for middle age group of dieters who had the most trouble losing weight in the first place due to low metabolism levels. Read our other articles to learn more about Weight Loss Supplements.